Few observers anticipated a 10% swing to the ruling People’s Action Party (PAP) in Singapore’s general election this month – not even the PAP leadership and its “true believers”. The government received 70% of the vote, an improvement from 60% in the 2011 “breakthrough” election – its worst electoral performance. How did the PAP achieve this? The PAP’s unbroken 56-year rule in Southeast Asia’s only Chinese-majority state has been underpinned by fear, insecurity and a subtle degree of ethno-nationalism. These features become more apparent when the 2015 and 2001 election results are closely examined. The 2001 elections were purposefully held just after the September 11 terrorist attacks. The PAP garnered a whopping 75% of the vote. The 2015 election was held after a nine-day campaign, the legal minimum. The electoral process was far from democratic, with the PAP systematically stacking the institutional odds in its favour. The government’s machinations suggest that, typical of elected authoritarian regimes, it remains hyper-vigilant and insecure. The vote was held shortly after extravagant National Day celebrations marking 50 years of independence, when nationalist fervour was high. Only months earlier, the nation’s “founder” and former prime minister Lee Kuan Yew died, garnering sympathy votes for the PAP. The Elections Department, an arm of the Prime Minister’s Office, arbitrarily redrew the electoral boundaries. The department abolished “problematic” seats that the PAP nearly lost in 2011, created new ones, merged others and redrew seats. These changes diminished the electoral clout of key voting groups, particularly the educated middle-class. In the last decade or so, they have tended to be critical of the PAP’s draconian actions against public intellectuals and supportive of opposition parties. Unlike the less well-off, middle-class Singaporeans are not strongly beholden to the government for subsidies and handouts. With the help of compliant media, a “smear and fear” campaign was unleashed against the Workers Party (WP) for supposed financial mismanagement of the Aljunied town council and the Singapore Democratic Party (SDP) for its left-leaning policies. Threatened by effective opposition campaigning strategies, the PAP unleashed its well-oiled propaganda machinery, particularly in the last five days of the campaign. 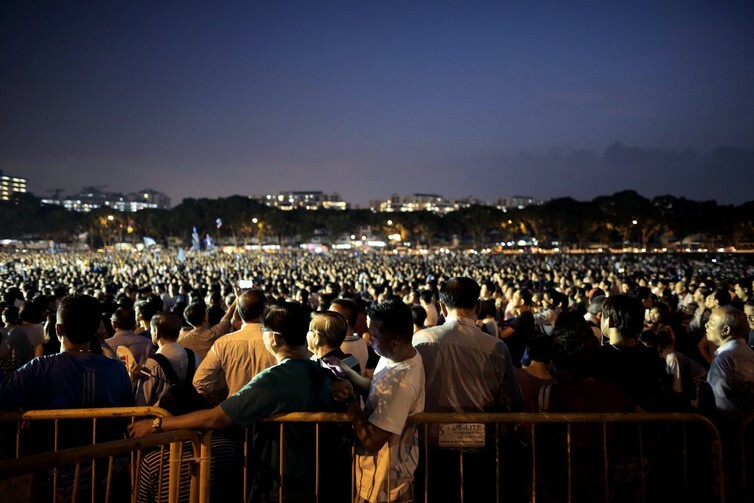 The PAP had felt threatened by massive opposition rallies, an impressive line-up of opposition candidates and the WP’s call to send 20 opposition politicians to the 89-seat parliament – an increase from the previous seven. The WP argued that stronger opposition representation was needed to put pressure on the government to institute much-needed reforms. The WP and SDP election manifestos offered comprehensive and coherent social and economic policies. These presented a sharp contrast to the PAP agenda, which retained unpopular policies in areas such as immigration, education and superannuation. Circuitous debates between opposition and PAP politicians, via the mainstream media and nightly rallies, indicated that many of the PAP’s technocratic ministers were handicapped by wooden personae and elitist attitudes. Their politically savvy opposition counterparts would likely have outperformed them in direct debates. Callous comments by one minister, Tan Chuan Jin, who said the aged poor who collect cardboard for cash were only doing it for exercise, shocked the public. For many, this confirmed suspicions that PAP leaders had become out of touch. In lieu of rigorous debates and analyses in the media, the contest of metaphors, puns and double-speak between competing politicians provided some relief from the grim reality of an election fought on a less-than-level playing field. Having failed to restrict the focus to the PAP’s leadership renewal and narrow town council issues, rather than national policy, and with the opposition gaining momentum, the government mounted a scare campaign. PAP leaders repeatedly warned that as all seats were contested, there was no guarantee that the PAP would form the next government. 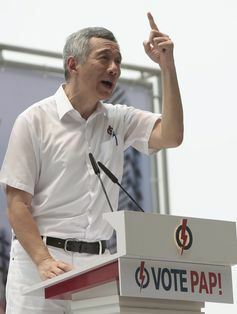 Voters were warned that even if the PAP was returned with a reduced majority, weak governance would ensue, jeopardising Singapore’s economic success. At a rally in the city’s financial district, Prime Minister Lee Hsien Loong spoke of the country facing oblivion (using the Chinese dialect word liow) if the opposition won government. The SDP’s policies of raising taxes for top earners, imposing minimum wages and increasing social spending were lambasted for taking Singapore down the road of failed economies such as Greece. The SDP’s proposed cut in defence spending was denounced as reckless because it would subject Singapore to the vagaries of regional (non-Chinese) bullies. Singaporeans were reminded of the debilitating political coups in Thailand, Malaysia’s slide towards political chaos, corruption and anti-Chinese ethno-nationalism, Islamist terrorist cells stalking the region and beyond, and China’s economic downturn. The PAP also raised the spectre of instability and turmoil in the West in the form of ethnic riots, moral decay and welfare-induced economic degeneration. In this threatening global environment, the inference was that only the PAP could safeguard the country’s security and stability. Mainstream media faithfully echoed the PAP’s discourse of fear. The media failed to rigorously analyse the major parties’ key policies. Comparing government and opposition policies would also have negated the PAP’s projection of itself as a national movement rather than just a political party. Former prime minister Goh Chok Tong brazenly opined that less debate and discussion on sensitive issues had contributed to the success of Singapore’s political system. Ours is not the same system as in the West. It’s modified for our needs. Singapore is certainly not a liberal democracy. It is not even a pluralist democracy akin to other industrialised nations in East Asia such as Japan, South Korea, Taiwan and Indonesia. In my 2009 book, Singapore in the Malay World: Building and Breaching Regional Bridges, I explore the PAP’s cultivation of a Singaporean identity rooted in a culture of fear, paranoia, ethno-nationalist insecurity and an ambiguous Southeast Asian consciousness – mirroring that of Lee Kuan Yew. Recent statements from the PAP leadership, the mainstream media and establishment academics suggest further political and electoral engineering may be underway. This is in line with the prime minister’s repeated assertions during the campaign that the PAP needed to “get the politics right”. 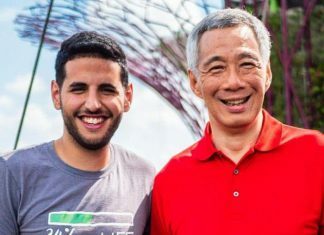 Having gained a solid mandate, the PAP is poised to get on with deepening the construction of a political model that purportedly works for Singapore. A long-serving regime and its formidable state apparatus, which presided over one of Asia’s most robust economies, has cultivated a citizenry that is prepared to press for substantive policy reform but remains fearful of regime change. Authoritarian regimes and one-party states, heartened by the PAP’s landslide victory, will no doubt be closely observing how it’s done. Lily Rahim, Associate Professor of Politics, University of Sydney. This article was originally published on The Conversation. Read the original article. DR LILY ZUBAIDAH RAHIM WILL BE A PANEL SPEAKER AT A TALK ABOUT INCLUSIVE NATION-BUILDING AND THE SPECIAL CONSTITUTIONAL STATUS OF SINGAPORE MALAYS, TITLED ‘THE SPIRIT OF ARTICLE 152’. MORE INFORMATION ON THE TALK HERE: THE SPIRIT OF ARTICLE 152.